Today is a special day for me - regular followers know that I've been unwell for quiet a few months and have been out of action lately recovering from surgery - but today I am back blogging! I have missed sharing and making my creations so much. I was missing stamping so much that last week I found myself wondering around my craft room wistfully and touching my craft supplies! So sad! While I am not yet able to sit and craft, I can prop myself up on the bed and post a few projects I made before surgery. Baby steps! If I had to choose a favourite Sale-a-bration product it would be the Botanicals For You stamp set closely followed by the Botanicals For You Designer Vellum stack. 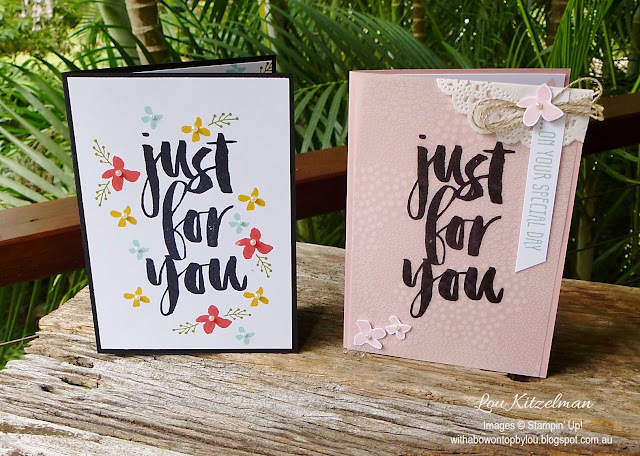 I made these 2 cards by simply CASEing (Copy And Share Everything) the Sale-a-bration catalogue on page 5. All Stampin' Up! catalogues are a wonderful source of inspiration so why not use them? It doesn't take much to whip up a card with this stamp set. The text is so lovely (and large) that it really only needs a few extra elements and you have a card. For this card I lay the vellum over Blushing Bride cardstock. It is a smidge narrower than the card front so that you get a border. Secure the vellum with glue dots under your embellishments so that you can't see the adhesive. Use Basic Black Archival ink to stamp the sentiment to get a nice crisp image. Dry with a heat tool to prevent smudging and having to wait for it to dry. This design will be great with other colours and using the other sentiments in the set. This card is not much different from the catalogue sample. Despite being really quick and easy I think that it is really effective. This stamp set makes decorating the inside super easy as well. 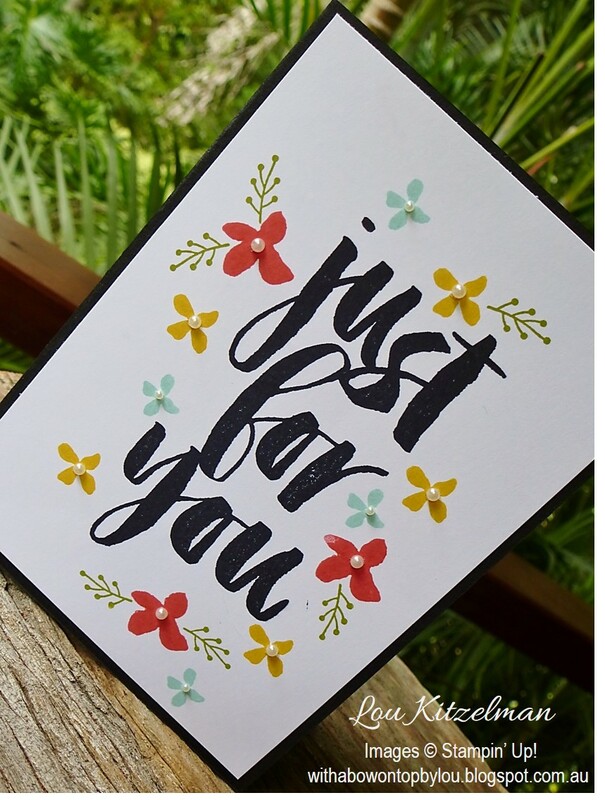 Just add a few flowers and leaves and choose one of the sentiments and you are good to go. Unfortunately I forgot to take photos when I was able. You have until the end of March 2016 to take advantage of Sale-a-bration offers. Simply spend $90 on any current products and you can choose a free Sale-a-bration product. 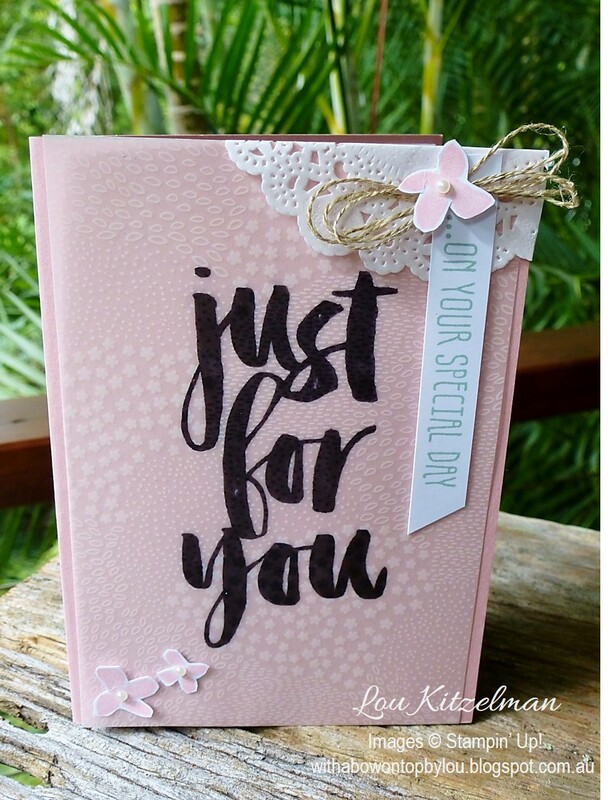 You can shop anytime from anywhere in Australia through my online Stampin' Up! store - simply click the button on the right of my blog to get products delivered straight to your door.